we currently evaluate Flexmonster as a tool for a business case at my company. We have a case (see the image attached), at which we combine values from different sources (turnover and bonus) for the same criteria and we calculate a relative figure on it (KPI = bonus / turnover). On level of raw data everything is fine with the KPI. But when aggregation on supplier or purchaser should be applied, how do we achieve the target with regard to turnover and KPI? 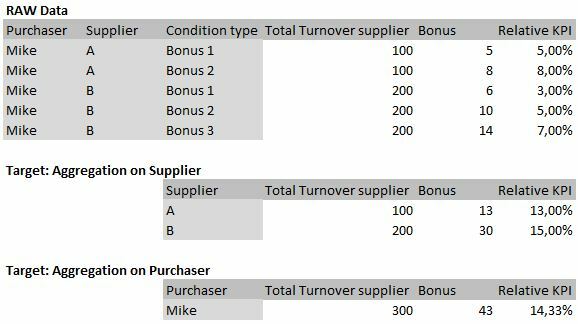 In case of aggregation per supplier the column [Total Turnover supplier] should only be considered once and NOT the SUM of all lines for the supplier. As i understood from other questions here, percentage logic always applies on raw data level?! But actually we would need the relative KPI being calculated on aggregated figures. Thank you for your interest in our component. Your rich description was very helpful to get the idea of your use case. As for the Turnover aggregation, our component does not support such type of summing when the member should be considered only once. In such a case, we recommend using other aggregations to achieve similar behavior. As for calculating KPI, we recommend using the calculated measure approach since it performs operations over aggregated data. You can also format the result as a percent. Please refer to our docs for more information on calculated measures: https://www.flexmonster.com/doc/calculated-values/. Also, we have prepared a JSFiddle example to describe the idea: https://jsfiddle.net/flexmonster/0yerj7xz/. The data was based on your screenshot. Please note that it is not possible to achieve the same result as on the “Target: Aggregation on Purchaser” part without changing the raw data structure.